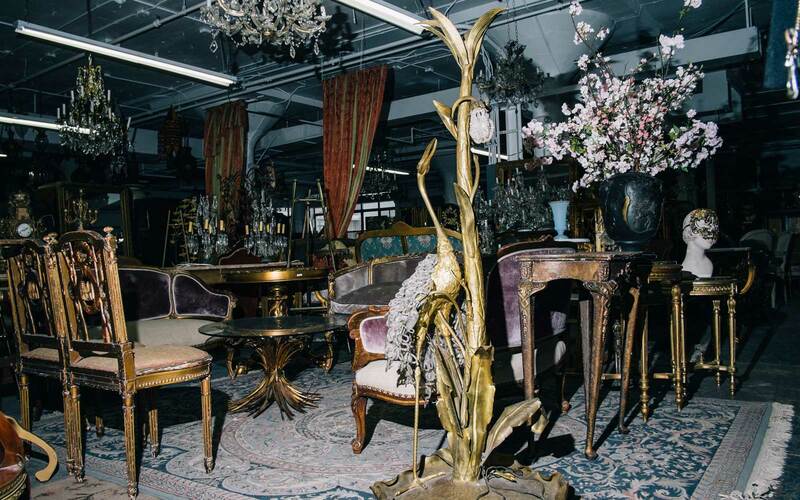 Eclectic/Encore contains more than 1 million props in a discreet Long Island City warehouse. 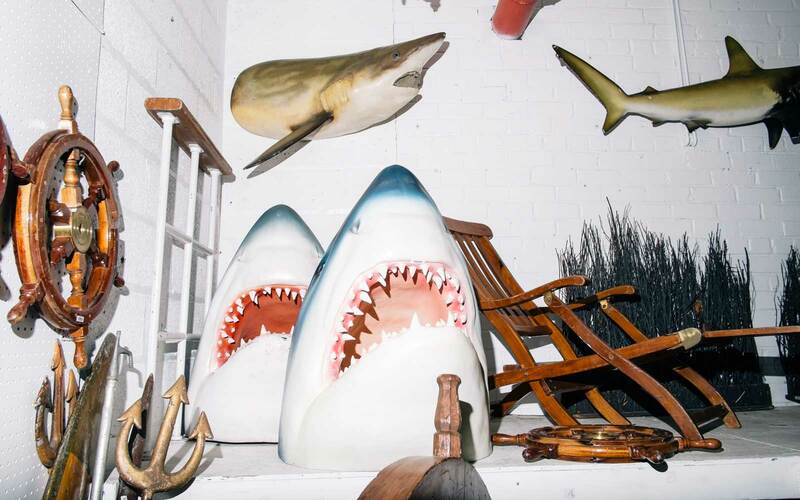 In the basement of a three-story warehouse in Long Island City, among an array of life-sized, open-mouthed plastic shark heads, Suri Bieler notices that something is missing. A small rubber shark she had rented to the film “Sharknado 2” was gone, never returned with the rest of the fake fishes she had lent to the science-fiction disaster flick. “Maybe it’s in ‘Sharknado 3,'” she said, smiling. A slightly chipped Egyptian Phoenix sculpture crouches nearby, not far from a set of larger-than-life Russian nesting dolls and a mechanical Zoltan fortune-teller. Venetian furniture, Versailles-style chaise lounges, and 1950s-era desks fight for space on the floors above while Moroccan-style cushions and Chinese wall hangings are barely contained in their designated areas. 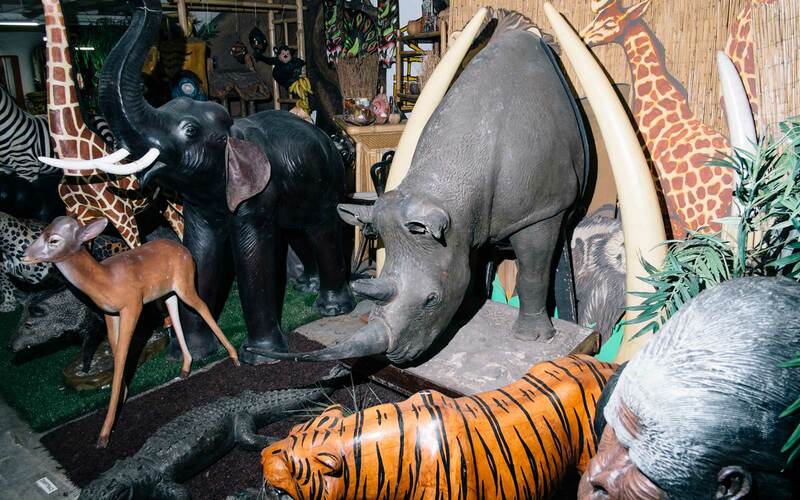 The guide and proprietor of this enormous collection of props, set pieces and other objects is Bieler, a veteran stage designer and owner of Eclectic/Encore, the largest prop company in the New York City area and one of the most prominent on the East Coast. 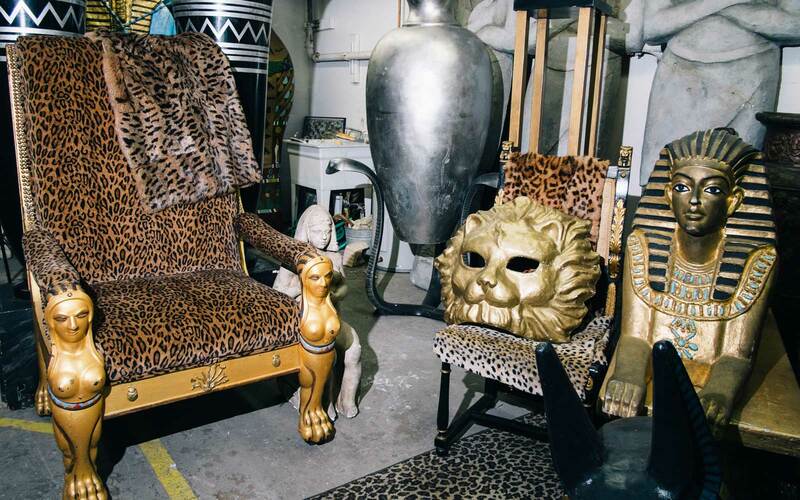 Bieler has made her living curating and renting props for the past nearly 40 years, and soon she hopes to expand her reach by welcoming members of public to tour parts of her sprawling collection. For Bieler, props are more than the backdrop to theatrical or cinematic storytelling; they can be characters in and of themselves. Bieler’s love of theater began with a passion for plays, while growing up in the Blue Ridge Mountains in Virginia. She attended the North Carolina School for the Arts in the acting program but soon realized the hubbub backstage captivated her more than anything else. “Once you’re onstage, you’re introduced to what happens backstage. And I realized: ‘Wow, look at that—it’s fantastic,’” she said. Bieler has a passion for the specificity of things, and this attention to detail is what brings the studio alive. No two television sets, phonebooks, or even crystal chandeliers are the same to her, as she discusses which kind of character would use a 1950s era blue television set or what kind of remote might fit best. “There’s so many different lamps. Things are similar, they function the same way, but they’re totally different,” she said. After graduating from college Bieler came to New York City in the hopes of working in stage production. Making her way from off-off-Broadway, to off-Broadway, to major Broadway productions, she became a force in the theater world. 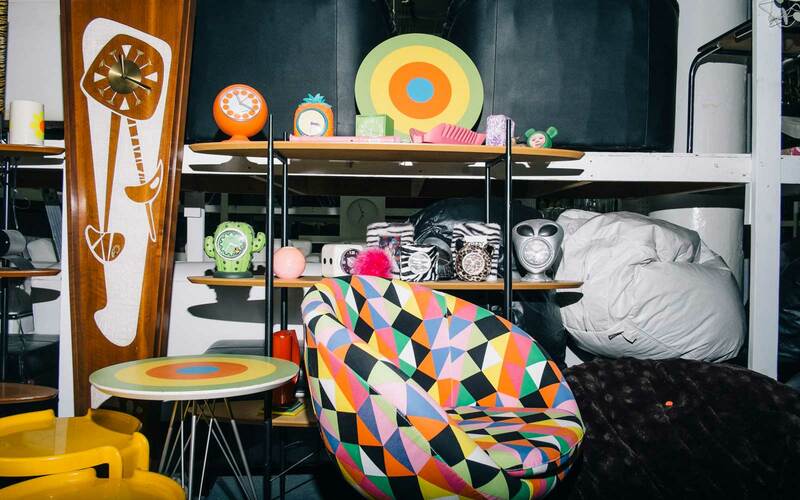 When shows ended their run, she would have first dibs on buying the props that couldn’t be reused, and she soon found herself with a sizable collection of items and the desire to start her own business. With $175 in her pocket and a $3,000 loan (obtained only after meeting with countless bankers), she put down the first month’s deposit on Eclectic Properties in 1979. Following the acquisition of century-old prop company Encore Studios in 1989, Bieler branched out to movies and television, still maintaining her touch for that one detail that transforms a living room set to a home, or a collection of fabrics and cushions into the backdrop of a Saudi caravan. Walking through Eclectic/Encore is a delight for any movie, T.V. or theater buff, with each room its own kind of contained theatrical chaos. 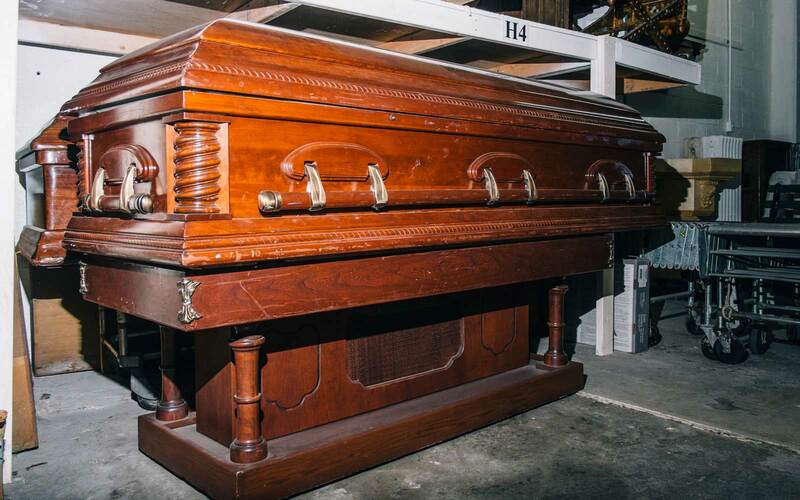 Sitting in one of the lower levels is what Bieler describes as the “go-to coffin” for “The Sopranos,” serving as the final resting place for any number of characters on the popular gangster drama. “They would change the interior color, the satin—for somebody it was black, somebody it was white, somebody it was pink,” she explained. An entire room is dedicated to antique medical instruments, including early 20th century pharmaceutical vials and surgical tools that “Boardwalk Empire” borrowed for scenes in the award-winning HBO show. The possibilities of Eclectic/Encore are seemingly endless. Turning one corner you stumble upon a Vincent Price-esque assortment of Halloween decorations and moments later you’re standing in a living room that would befit an early Marilyn Monroe, all velvet and luxury. “One of the most exciting things is to see the combinations people put together for the living room, let’s say. Because they’re creating a character, and in their minds these objects that we’d never put together—but it works, it all works,” she said. The tours will allow visitors a glimpse into this world of set designers and stage production, giving New Yorkers and tourists alike a sense of the sheer amount of foresight that goes into creating a set for “American Gangster” or “Age of Innocence.” Eclectic/Encore will continue to function a working prop rental company, and the tours—planned to begin in spring of this year—will be an addition to the current enterprise. Accessibility to Long Island City has been steadily increasing over the past several years as hotels and vacation rentals have cropped up as more affordable options. New York Gov. Cuomo has also made pledges to build up Queens as a tourist destination in the coming years, with planned improvements to nearby La Guardia airport. Some of the most captivating objects in Bieler's possession are the most unassuming. In a room labeled “ephemera,” Bieler curates all of the trappings for era-appropriate window displays, from vintage Maxwell coffee cans, to 1980s phonebooks, to Western Union telegraphs. 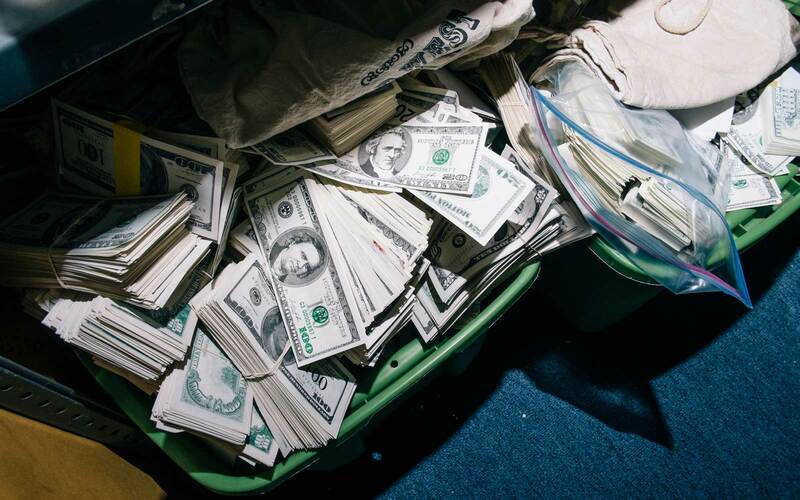 This section also contains hand-written letters and a variety of fake currency for use in different productions. 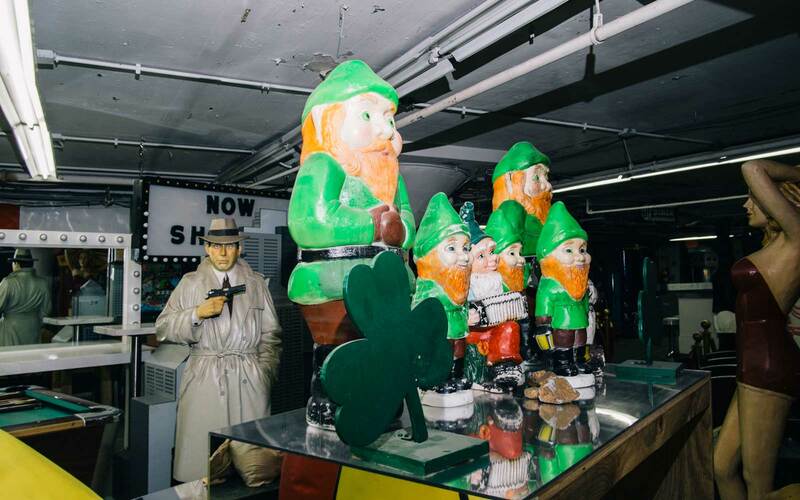 The company has continued to acquire objects from all over the country throughout the years, picking up some after the closing night of plays, finding others from strangers who email the office, and nabbing still others at estate sales. 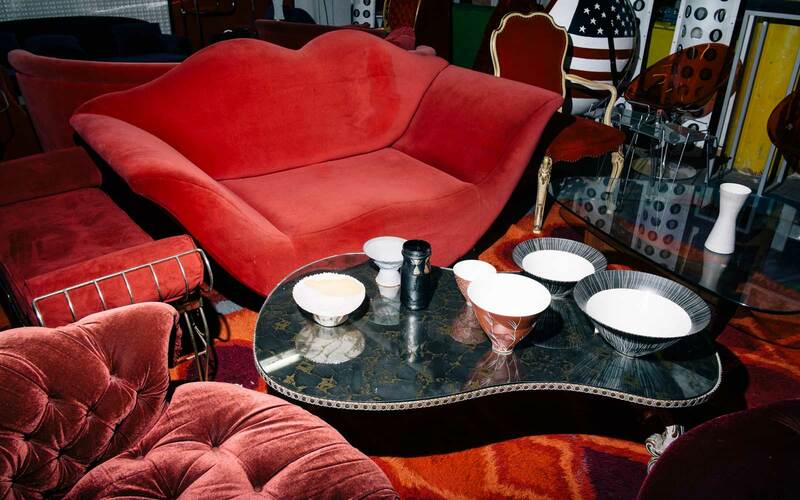 When asked how she decides whether something is worth purchasing, Bieler said it has less to do with the antique value of a single piece and more to do with its own uniqueness within her collection. 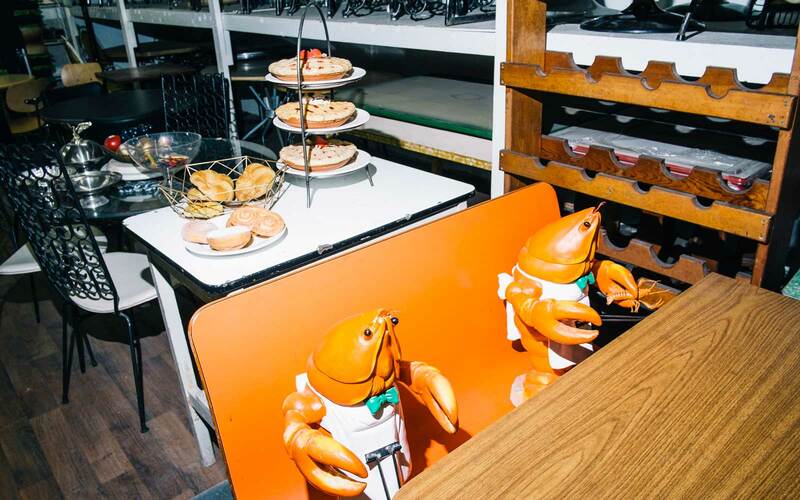 Walking through a room filled with diner paraphernalia, including 1950s-style countertops, booths and kitschy crustaceans with slatted claws made for holding menus, T+L asked if we could photograph Bieler among some of her scenery. She shook her head definitively no.